This Vegan Eggplant Meatball Marinara has been a work in progress in my mind for awhile now. Each time I attempted to make the “meatballs” with just eggplant and breadcrumbs, too mushy. Finally, I drew from my positive experiences with these Veggie Nuggets and these Crispy Chickpea Cutlets over on my sister site, Living Vegan. I had to give it some substance and so I determined chickpeas were the answer, though any white bean will do. 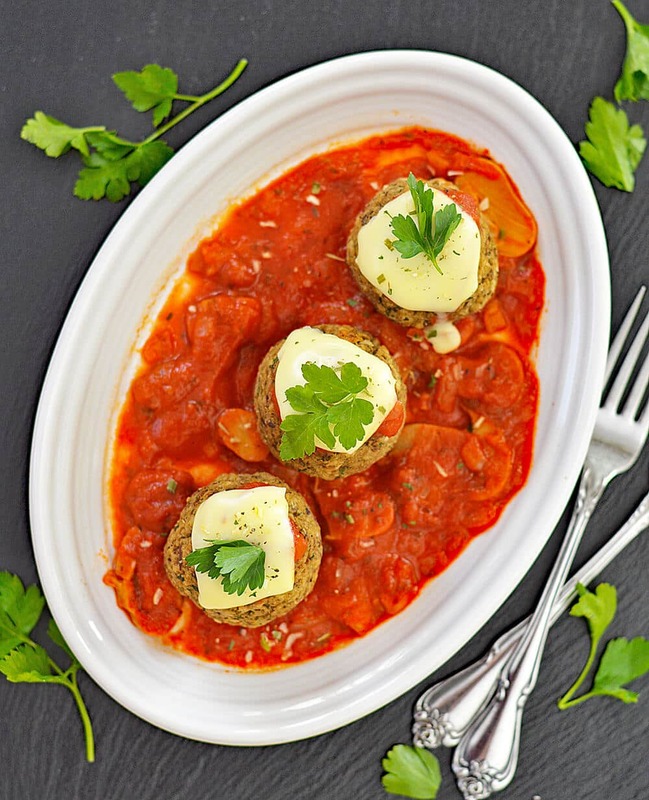 I place the Eggplant Meatballs on my simple mushroom marinara and top it with a bit as well. Next up, my favorite vegan cheese (read all about it here) and a sprinkle of Italian seasoning. The vegan cheese melts nicely under the broiler or in a microwave for a few seconds. I did saute the onions and eggplant until tender and then added them to a food processor with panko breadcrumbs, parsley, salt and pepper. I pulse until it looks like the center photo below. You will need to refrigerate this mixture until it firms up. I rolled into larger 2-1/2″ balls and got 7 from this recipe, but you could make smaller balls if you prefer. Bake at 375 degrees for about 20-30 minutes. They should be set, but will still be tender inside. Near the end, I brushed the tops with a bit of oil or butter for a crisper exterior. My mushroom sauce is simple. I use a store bought marinara and add caramelized onions, garlic and of course, sliced mushrooms. Simmer until it thickens a bit and then season with salt and pepper. 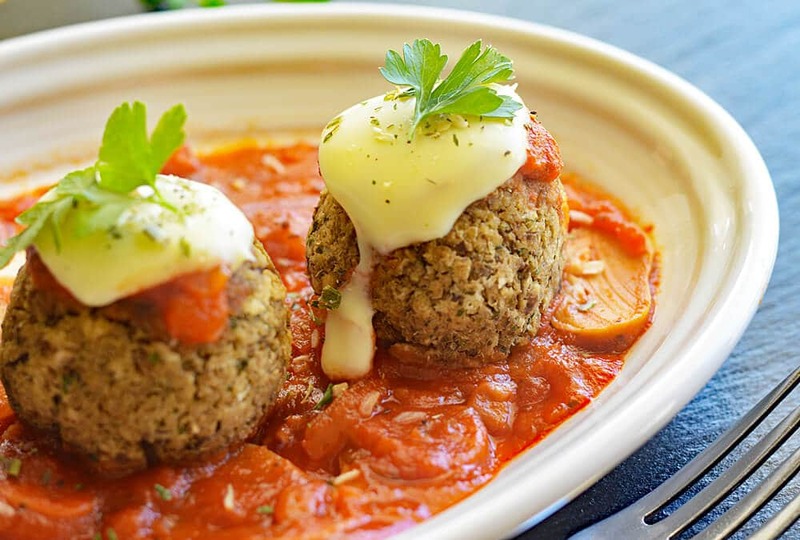 The final step is to top each meatball with a spoonful of the sauce and a piece of any meltable vegan cheese. To get this one melty, I placed my heat proof serving dish under the broiler for a few minutes. I give a sprinkle of Italian seasoning and garnish with fresh parsley. 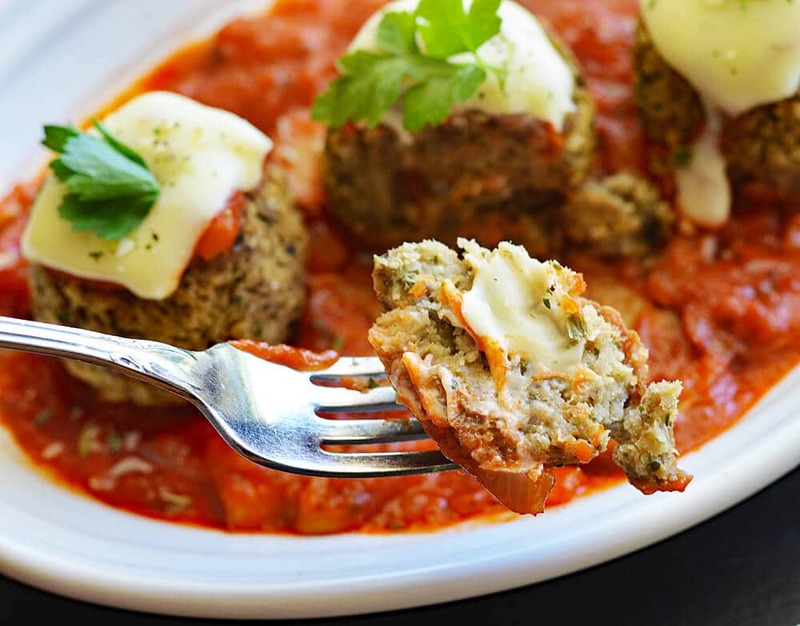 The texture is a lot like meatloaf in meatball form. As I mentioned, I used three larger balls as a serving on these single serve oval plates. You could certainly make smaller balls and incorporate them into a spaghetti sauce at the very end of your cooking time. In a medium skillet over medium high heat, add the oil and onion. Saute for 5 minutes. Add the eggplant cubes and water, sauteeing until the edges are starting to cook and get golden brown. Add the garlic at the very end, cooking for just a minute or two. Season with salt and pepper. Cool before processing. Add the eggplant mixture to a food processor along with breadcrumbs, white beans or chickpeas and parsley. Pulse until blended. Refrigerate until firm, at least an hour or so. I did mine the day before. 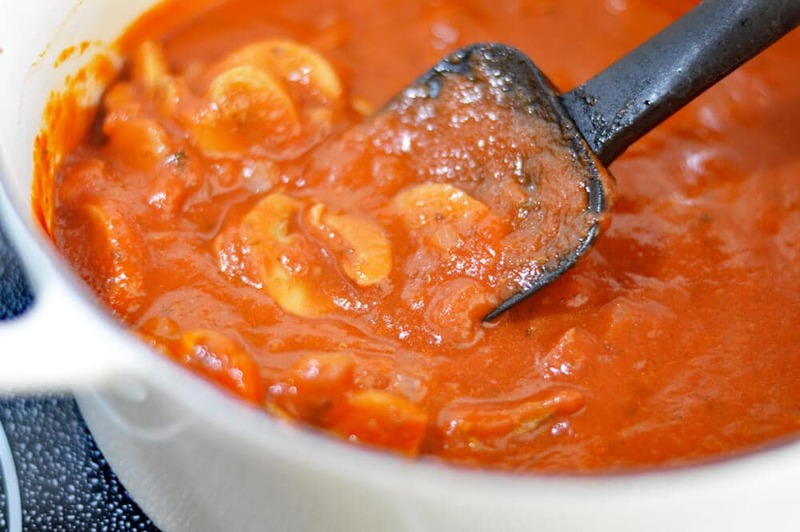 To prepare the mushroom marinara, saute the onion in a bit of oil (plus vegan margarine, if desired) over medium heat until golden and caramelized. Add the sliced mushrooms sauteeing until just cooked. I like a bit of texture, so I don't overcook these. Add prepared marinara and cook for about 10 minutes until thickened slightly. Using an ice cream scoop (or your hands and a good eye), shape the balls to desired size taking care to compact the mixture and rolling to smooth out the balls. Bake at 375 degrees until firm to the touch, about 20-30 minutes. During the last 10 minutes or so, I brush with vegan margarine or oil so they get a crisper exterior. This is optional. 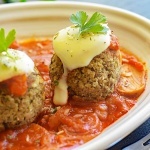 Place down a layer of the marinara, the meatballs on top and spoon some sauce over each ball. Add a piece of vegan white cheese (slices or shreds - anything that melts a bit) and place either under the broiler using a dish safe at this heat OR you can even microwave for a few minutes. Finish with a sprinkling of Italian seasoning and a sprig of fresh flat leaf Italian parsley.